Newcomer Family Obituaries - Anna Jean Montana-Dye 1926 - 2018 - Newcomer Cremations, Funerals & Receptions. Anna Jean Montana-Dye of Lakewood, CO died at the Windsor (CO) Health Care Center, surrounded by her family on November 19, 2018. She was 92 years old. Anna is survived by her two daughters, Maria Sprenger (Mark) of Fort Collins, CO and Michelle Naish of Lakewood, CO; her five grandchildren (Krista Sprenger of Malibu, CA, Kayla Bergholz (Bryan) of Lakewood, CO, Kelley Howe (Chad) of Bozeman, MT, Jacqueline Ramirez (Kelvin) of Lakewood, CO, and Cameron Naish of Golden, CO); and her four great-grandchildren (Kameron Naish, Sophia and Faith Howe, and Graciela Ramirez). She is preceded in death by her two husbands, Michael Montana and Robert W. Dye, and her brother Andrew Bondi. Anna was born on August 24, 1926 in Brooklyn, New York to Francesco and Maria Bondi. Anna spent her youth immersed in the Italian culture of Brooklyn, NY. These included family first, good food, traditions and loud conversations! Anna only spoke Italian until she attended an English-speaking public school at the age of six. 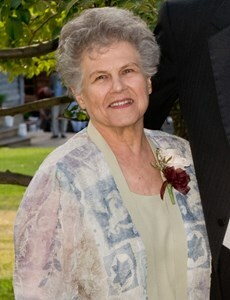 She attended an all-girls trade school during her high school years, developing her gift as an accomplished seamstress. In her early twenties, Anna worked in some of the finer clothing stores in Manhattan, NYC. Through the years she made many a dress, coat, and even a wedding dress for daughters, grandchildren, relatives, and friends. On November 20, 1949, Anna married the love of her life, Michael Montana. They enjoyed their early days of marriage in the neighborhoods of Brooklyn, surrounded by family and life-long friends. In October of 1961, while witnessing significant cultural changes in Brooklyn, Anna and Mike moved their small family to Denver, Colorado “to give our two daughters a better life”. The move was hard but Anna and Mike were up for the challenge. Denver became their new home and they lived happily until Mike's sudden and unexpected death on September 9, 1986. Several years later, Anna met Bob Dye and they were married on August 3, 1992. Over their 9 years together, they enjoyed many fun times of traveling, dancing and making new friends before Bob’s passing on January 30, 2001. When Anna wasn't working as a seamstress, she was a mom and homemaker, always making sure to be around for her two girls when they needed her. Always family first! Anna also spent time at her church volunteering in the pantry kitchen or helping to clean the sanctuary. She was always willing to lend a helping hand to a friend or stranger. “Nana”, as she was fondly known by all, loved her family above all else and was a firm believer that anything could be talked through over a nice Italian meal and a good glass of wine. She claimed to make the best Manhattan cocktail in the city (this has yet to be disproven) and any special guest was always surely offered one. Known for her frank honesty and wise “sayings”, Nana's final advice for a well-lived life was, "Keep the faith in challenging times.… and Have Fun!" Add your memories to the guest book of Anna Montana-Dye. ..... when she came into my kitchen and asked if I had an Italian flag.... no, but would a dishtowel with the map of Italy on it make do? Sure! I said, "wha????" She said, "Pasta sauce....wedding....don't tell..." 'Nuf said. We were so saddened to hear of your mom's passing, but hope you are finding peace and comfort in the memories she made for so many of us during her long life. There was a time in my growing-up years when Anna was almost a second mom to me and I'll never forget drinking tea in her kitchen or the melodious sound of her voice...and her fabulous New York accent! She and Mike raised two beautiful daughters whose friendship remains a blessing in my life a half century after we first met. There is one shining new star in the heavens now, but our world will always be a little less bright without her light and love.